Thank you for your interest in purchasing maginei services and merchandise. We use PayPal for online credit card purchases to ensure high security of your personal information. If you'd rather pay by cash/check, or want to place your credit card order by phone (without having to go through PayPal system), please contact maginei directly by email or phone us at 831.239.8159. Pay for your maginei portrait session using our secure PayPal system. Pay your $500 retainer using our secure PayPal system. All photo sessions include a pre-session consultation, online proofing and a print ordering gallery. Commercial services also include private FTP. For commercial and editorial licensing, we will provide you with a written estimate after receiving the form below and discussing details of your photography assignment. maginei gift certificates are the perfect solution for all of your gift giving needs. Gift certificates can be redeemed for portraits sessions, prints, framed wall hangings, or store merchandise. We'll send the gift certificate in a signed greeting card, with your compliments. Get ready to save 20% and more when you order prints through the maginei print package program. 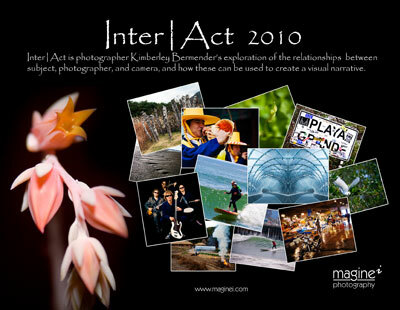 Don't forget those important dates with our 2010 Inter|Act twelve-month calendar with select images from Kimberley Bermender's 'year in review'. This high quality calendar measures 8.5" x 11" when folded, and 11" x 17" when hanging on your wall. Send the perfect message with these fine art greeting cards. Designed to easily remove and save the 6" x 4" photos. Choose from a selection of images (max 3 different images per package).